This entry was posted on Friday, December 24th, 2010 at 2:35 am	and is filed under Meri Awaaz Suno. You can follow any responses to this entry through the RSS 2.0 feed. You can leave a response, or trackback from your own site. Hi – I am Rafi Sahab Bhagat. I have made some sketches of Rafi Sahab.Please advise me how i can upload these in this site so that I can also pay a small tribute to THE GREAT RAFI SAHAB. there are two appearances the almighty made in the blessed land of bharat and every bharatvaasee never refutes and protects it with a smile ( irrespective of religion caste creed colour ) simply because in both the appearances the birth life and death was in bharat itself. Thanks for your comments. I just wanted to let you know that I did send my response (post 12) to this site with a request to send it privately to Almas’ email address if they thought that to be more appropriate. Anyway, now that it has been published, some of you have seen it – but I don’t think any real harm has been done. We can let the matter rest here, as very wisely advised by some of you. mr. Almas : culd u kindly advise the painter m f hussein saab on the same lines please – if u know what all he paints. pls stop this holier than thou attitutude – just now. what you have said is highlighted in the basic tenets/rules/byelaws of http://www.mohdrafi.com. religion never to be discussed or written about in this website, the authorities have an over-riding authority to expunge/delete or not publish such literature absolutely and is punishable under law. hence, these views, may be good and innocent in nature but should be strictly avoided and the same can be expressed freely in their personal email id’s or via letters in post. this has been written by me with malice towards none and with high respects to all religions. i hope the wise person will understand that this is a site for music lovers and mohd rafi saaheb. i hope he would not bring religious viewpoints herein. pls oblige. Dear Almas bhai and Nasreen ji, I am a daily visitor to this site, though I seldom write my comments. But, I feel the need to put forward a point here. Let us put an end to this religious discussion here. this site is dedicated to Rafi Saab and if someone puts up a sketch of Rafi Saab , it doesnt amount to worshipping him. It is just an admiration of Rafi Saab, which is very much legitimate. I think we must stop this discussion here, as it does not augur well for this site. Religious beleives are individualistic and personal matters which need not be discussed in an open forum. Let us concentrate on the larger picture – which is the propagation of Rafi Saab’s legacy onto the coming generations. I fully agree with dr Khaja aliuddin in his comment – post no. 13. Dear Almas Bhai and Nasreen Bahen, ASA, I implore and request both of you, please restrain yourself for any more discussion and put it to an end. No one is perfect, Allah SWT knows the best. Please forgive me, if I hurt any body. An ardent fan of Rafi Sahab. Thank you for your comment. To remove your slight doubt as to whether I am a muslim, yes I am. Almas, I really appreciate your concern and the fact that you have said what you did only out of good intentions. It is not easy for me to explain my viewpoint, and neither do I feel that this is the site for such things. But neither can I leave it unanswered. Let me say just a couple of things. There are many different interpretations and opinions as to who is a good muslim, or what is islam, etc. I really do feel it is a personal matter. I would also like to say that you must not take anything on face value. I think that rules in islam are generally based on reason such as this one about making pictures of people. The reason why we were advised against making pictures of people is that we may be liable to misuse them by starting to worship them or defile them in some way. Yet – you seem not to have any problem with the fact that there are many pictures of Rafi Sahab on this site. There are many muslims who do not watch TV or use a camera to take photos of people. What I have to say is, whether it is a photo or a sketch, the fact remains that it is a depiction of that person. So by that token, you should not also be looking at his pictures. But it is impossible to avoid looking at pictures of people, they are all over the place. Almas, in spite of appreciating and being grateful for your sincerity in advising me as a fellow muslim, I still do not think there is anything really wrong with doing a sketch of Rafi Sahab. It is one’s “niyyat” that is most important in any action. If it comes to that, would you question someone as pious as Rafi Sahab whom you have yourself described as a “farishta”? I think he is one of the most devout muslims – and yet, he sang “Hari Om” “Govinda Aala Re” and many many bhajans. He did it with great sincerity and devotion – this is because he could see the big picture. a rose is a rose no matter what language you use to describe it. Ultimately, we are all the same. It is the same Creator who created christians, hindus, mulsims, jews, buddhists, Indians, pakistanis, australians, americans, arabs, jungle people, city people, etc. We should try not to get bogged down by little things because that will make our lives narrow. My intention in making a picture of Rafi Sahab was just because I admire him and that was my little way of expressing it. That is all. Just like you also felt something and your post was your way of expressing this. Thank you for doing so. However, I am sincerely sorry if it offended you – but would also urge you to please try and find acceptable reasons behind the actions of people. Dear a almas I think we r so small to advise people what they are doing and what is right or wrong,Allah is so great and Allah made us,so enjoy ur life on ur way,I am sorry if u mind, Islam said us many good things . We have plenty of pictures of Rafi Saab all smiling face. That is good to see our farishta. but about your sketch I have nothing to say whether I should appreciate or criticize, since I do not know your religious beliefs. by name you seems to be muslim, in islam to draw the animate or living things is prohibited. I really do not discourage you, but if you are doing this since how long I do not have any idea. please stop drawing sketches especially living things from now on, If you understand my concern. I just happened to be your well wisher. thank you all for your sweet comments in response to the sketch. I did it one day when I was doing a number of different sketches (of different people) and this picture was on the cover of an LP record of Rafi Saab which I was listening to. It is certainly nowhere near an expert sketch, but I am so grateful to the administrators of the site for their extreme kindness in publishing it. Thanks so much. But yes, as I have said once before on this site somewhere, I think we all (his fans) feel related to Rafi Sahab. My brothers along with countless others refer to his songs simply as “chacha’s songs”. And my daughter refers to him as “Rafi Nana” which makes me smile. Well, let us keep honouring this great soul who gave us so much feeling, through his songs. Rafi Sahab, aap ki meethi nazar ko salaam, aap ki meethi andaaz ko salaam aur aapki meethi aawaaz ko salaam. you hav captured the beautiful and saint-like smile of our beloved Rafi saab very nicely, keep up the good work ! all the best ! Dear Sister nastreen,all the best. There are no words to praise the sketch of god father of music.Rafi sahab was always smiling.He delivered smiles to the people who loved music all the world over.His heavenly voice touched the souls of the music lovers and gave the healing effect to the depressed ones.Many greetings on the birth day of angle of music. Hi! This is sagar from Pune. http://www.rafifanblog.blogspot.com/ is a nice blog.while watching the blog i saw video right where rafi sahab is standing with the folding hand. please remove the video. looks to bad while the video get repeated. feel like rafi sahab standing for you to welcome you. anyway. thanks for the blog. pyar karte hai rafi sahab se is liye itna sochte hai. don’t want mind sir. 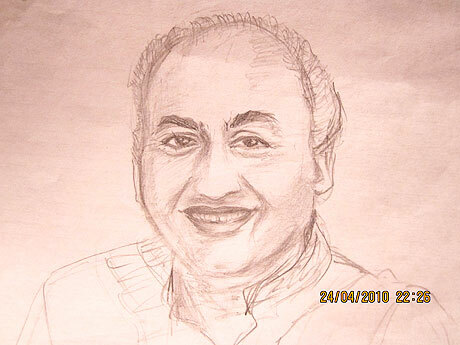 A very nice sketch of our “FARISHTA” on his b’day.thanks for sharing this on this blog. Many happy returns of the day to our FARISHTA.. I was just wondering that one of Rafi sahab’s daughter was also named Nasreen, if the author is the same ?